In spite of the overall increase in internet usage among Latinos from 2006 to 2008, the percent of Latino online users who accessed the internet from home went up only marginally from 79% in 2006 to 81% in 2008. White internet users were more likely than Latino internet user to go online from home – 94% said they did so. Among black online users, 87% reported going online from home. 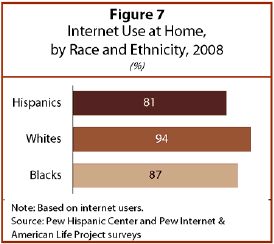 The fact that Hispanic internet users and, to a lesser extent, African American users, lagged whites in the likelihood of having internet access at home may be related to the fact that Latinos and African Americans are more likely to access the internet using wireless technology such as a cell phone, Blackberry or iPhone (Horrigan 2009). Both education and household income were linked to the likelihood of having a home internet connection for Latino internet users. While less than two-thirds (64%) of Latino internet users who lacked a high school degree went online from their home in 2008, this share rose to 84% for Latino high school graduates. The overwhelming majority (94%) of Latino users who graduated from college were able to access the internet from their home. Similarly, while 7-in-10 (71%) Latino internet users with annual household incomes less than $30,000 used the internet from home in 2008, rates were higher for Latinos with higher incomes. For those in households earning $30,000 to $49,999 annually, 83% had a home internet connection, and for those in households with annual incomes of $50,000 or more, 92% had a home connection. The likelihood of having a home internet connection was not linked to nativity, age, or homeownership for Latinos.